Girls use their new school supplies during a class in an informal learning centre in a UNICEF-supported safe space for children in the Dalori camp for internally displaced people, in the north-eastern city of Maiduguri in Borno State. Condemning in the strongest terms Saturday’s “horrific terrorist attacks” attributed to Boko Haram in northeastern Nigeria, which resulted in a large number of dead and wounded, the United Nations Security Council today called on all States to cooperate in bringing the perpetrators to justice. 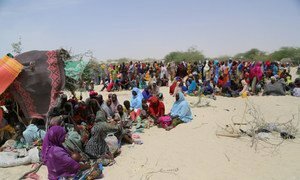 “The members of the Security Council reaffirmed that terrorism in all its forms and manifestations constitutes one of the most serious threats to international peace and security,” the 15-member body said in a press statement, which condemned the attack on Dalori village, in restive Borno state. According media to reports, Boko Haram, armed with machine guns, raided the village on Saturday, leaving more than 50 people dead and wounding dozens more. It expressed their deep condolences to the families and friends of those killed and injured by “these heinous acts” and commended regional efforts, including through the Multi-National Joint Task Force, to combat Boko Haram. Reiterating that any acts of terrorism are criminal and unjustifiable, regardless of their motivation, wherever and whenever, and by whomsoever committed, the Council reaffirmed the need for all States to combat by all means, within the framework of international law, threats to international peace and security caused by terrorist acts. Three United Nations human rights experts today called on the Government of Nigeria to assist in the rehabilitation and reintegration of women and children who escaped or were liberated from Boko Haram captivity.